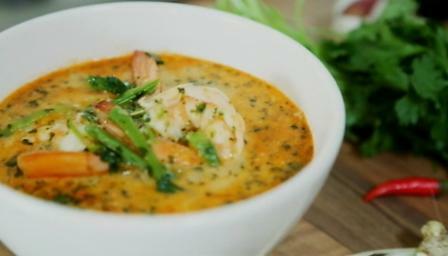 This prawn curry combines a fresh-flavoured Thai spice paste with a simple homemade stock for a tasty sauce. Each serving provides 185kcal, 25g protein, 5g carbohydrate (of which 4g sugars), 7g fat (of which 1g saturates), 2.5g fibre and 1.2g salt. First, prepare the stock. Remove the shells from the prawns and set the prawns aside. Place the shells in a small pan and cover with water. Add the lime leaves and peppercorns, then simmer over a gentle heat for five minutes. For the spice paste, place the garlic, lemongrass, ginger and chilli into a small food processor and blend for a few seconds. Add the coriander and blend to a rough paste. Strain the prawn stock through a sieve, discard the shells, then return the stock to the pan and keep warm. For the prawns, pour the oil into a large, heavy-based saucepan over a medium heat, then add the spice paste. Fry gently for two minutes then add 300ml/½ pint of the stock. Add the coconut milk, a generous pinch of salt, the mangetout and the prawns. Simmer for 3-4 minutes. Divide the beansprouts between two large bowls, then spoon the prawn curry over the top, allowing the beansprouts to cook in the residual heat. Serve immediately.